All modern studios and apartments are spacious and colorfully decorated, with views to the beautiful garden from balcony or terrace. 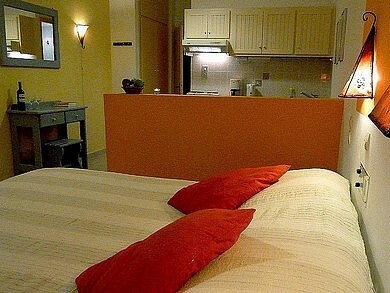 The bedrooms have box spring beds, and for the somewhat chilly evenings in early spring or late autumn, even duvets. 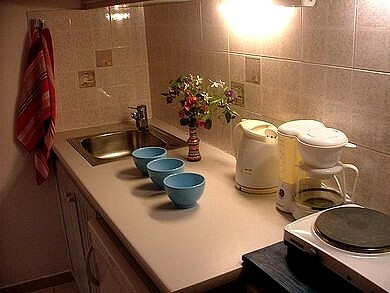 Your kitchen is well equipped to cook and prepare breakfast. The cutlery, the glassware and the pottery are very complete. Microwave and coffeemaker are among the inventory. The bathrooms are bright and clean, and equipped with showers cabins. Maria, our cleaning lady, will bring you new linens every four days. There’s a cleaning kit with new brush, cloth and sponge for every new guest. 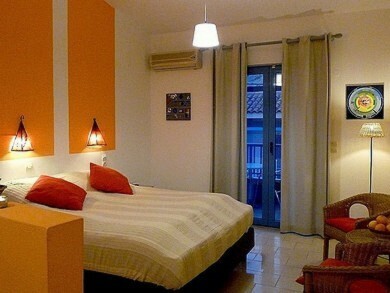 These are one room apartments, suitable for up to three people. These include a living room and separate bedroom. The living room has two beds, which can serve as daytime couch. They suit a maximum of four to five people. One of our two room apartments is accessible for wheelchair users. This is a combination of a studio and a two room apartment, next to each other, with the advantage of an extra bathroom and a second kitchen. Prices are on request. Our dependance with great views can also be rented in its entirety for groups of up to about twelve people. Aleikos Panorama has three apartments and a studio as well as a large terrace with views of Mirtos, the sea and the mountains.